Do you know why we have the habit of buying gold on akshaya tritiya? Actually India is a land of multiple religions and traditions, where people from all faiths come together to celebrate events. All festivals and celebrations in the country are incomplete without a touch of opulence, be it in the form of music, food, dance or gold. Akshaya Tritiya is an extremely auspicious day in our country, with Hindus and Jains across different denominations celebrating it with fervour. Falling in the month of Vaisakha, it is considered to be one among the four most important days in the Hindu calendar. 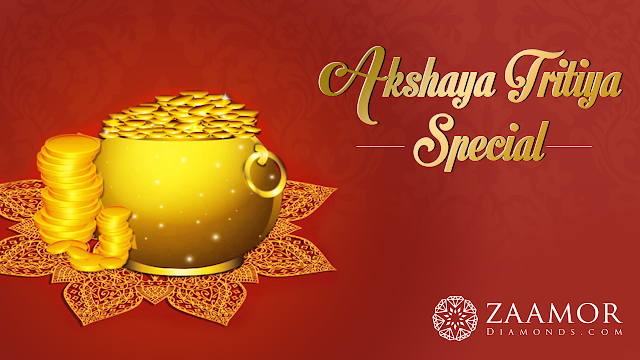 Akshaya Tritiya is believed to be an extremely good day to embark on new journeys, with any new venture undertaken on this day assured to grow and bring happiness and prosperity to people. We know that Indians love gold, with the country being one of the biggest consumers of gold in the world. While the country has gold reserves of over 550 tonnes, the total gold in the country is estimated to be over 20,000 tonnes. Given this addiction to gold, it is safe to say that Indians don’t really need an occasion to purchase it, but any auspicious day just adds to our love for gold, with sales peaking during Akshaya Tritiya. Actually investing in gold on this day heralds the start of a new beginning. You know if Mythologically speaking, Kubera, the treasurer in Heaven received his wealth on this day from Siva. It is on this day Lord Siva blessed Goddess Lakshmi with wealth. In fact Lord Siva made Kubera as Lord of wealth and Lakshmi as Goddess of wealth. Lord Sri Krishna visited Pandavas and blessed Draupathi with the Akshaya Patram. So it’s believed that whatever good things you do on that day are blessed…Let it be buying gold, starting new venture or anything. But more than all feeding the poor is the most important charitable act. Hopes for akashaya tritiya you are going to purchase gold for sure, isn’t it ?